The entity which survives death is known as 'The Soul' by Christians and as 'The Very Subtle Mind' by Buddhists . This will be abbreviated to 'Mind' for the rest of this article. The terms 'Soul' and 'Mind' are not equivalent. There are a number of minor distinctions between the concepts which, taken by themselves, could be regarded simply as trivial doctrinal differences. However, there are also two major philosophical differences which separate the concepts of mind and soul into different ontological categories. The minor differences are tabulated first. 1 The soul does not exist preceding this life. The mind has had countless previous lives. The soul has a one-shot chance of salvation. It is judged at end of this life and either goes to heaven or hell, except for children who have died before they can be baptised, who go to limbo, or hell if you believe St Augustine. 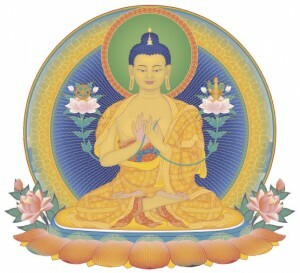 If the mind does not achieve enlightenment in this life, or enter a Pure Land at death, it will have further rebirths. 3 Souls of sinners burn for all eternity in hell. All sentient beings will eventually be rescued from suffering and become enlightened. 4 Only humans have immortal souls. Animals are purely physical (non-spiritual) beings. All sentient beings have minds. 5 The soul of a human is a totally different thing from the mind of God. The minds of all sentient beings have Buddha seed or potential Buddha nature. The soul comes into the world contaminated with Original Sin, which it has inherited from Adam following the Fall from Grace. Without the intervention of Holy Church it is certainly destined for hell. The mind comes into the world bearing positive and negative imprints from its previous existences. - As the song says "You got to accentuate the positive and eliminate the negative." Souls which have entered heaven do not return to earth. An Enlightened Being may choose to leave the Pure Land and be reborn in human form to lead others to enlightenment. 8 According to the more traditional Christian thealogians, the soul of a child which has been condemned to limbo by dying before it can be baptised, is forever beyond the reach of Christ's salvation..
 Apart from Quakers who believe that everyone has an 'Inner light' , or a spark of Christ within the soul. 2.1 Plurality and singularity of the soul. In standard Christian theology, the soul is an individual entity which is totally separate from other souls and (can become) totally separate from God. There is thus one God (or maybe three depending on how you interpret the Trinity) and a plurality of souls. Every person has exactly one soul. Buddhist philosophers are wary of applying the concept of number to God(s) or mind(s). At a conventional level, we may indeed refer to the mind of a sentient being, but what we are actually talking about is a series of instances of awareness. The mental continuum of every sentient being is ultimately inseparable from the mental continuum of the Buddha(s), and thus from the mental continuum of all other sentient beings (Hence the Buddhist emphasis on compassion and exchanging self with others) . The fundamental problem in trying to use numbers to describe or categorise mind(s) is that mind has ontological precedence over number. In other words, number is a conceptual tool generated by mind. Numbers have no existence other than as objects of mind(s). It is thus difficult to see how numbers can be employed to delimit mind(s). These ideas are not totally foreign to Christian metaphysics. One of the Biblical names for God is 'Elohim' - a plural. No man is an Island, entire of itself; every man is a piece of the Continent, a part of the main... Any man's death diminishes me, because I am involved in Mankind; and therefore never send to know for whom the bell tolls; it tolls for thee. Souls are governed and constrained by number. Mind(s) are not. According to Christian theology, the world existed objectively as a collection of well-defined things in advance of the appearance of souls. In the Genesis version, as believed by 'young earth' creationist theologians, humans were created on the Saturday of the first week, after God had created land, sea, stars, planets, birds, beasts fishes etc during the previous Monday to Friday. Since only humans have souls, all these features existed quite concretely in the absence of observers. In contrast, theologians who believe in evolution subscribe to the 'soul-injection theory' , which states that "There came a moment in the evolution of hominids when God intervened and injected a human soul into a previously animal lineage. (When? A million years ago? Two million years ago? Between Homo erectus and Homo sapiens? Between "archaic" Homo sapiens and H. sapiens sapiens?) " Again, all the features of the world existed in the absence of souls, in this case for many hundreds of millions of years rather than one working week. So, to the Christian, reality is totally objective and souls have no part in determining the existence of the real world. This is in marked contrast to the Buddhist view of reality, which is participatory and involves the activities of the mind. Both subject and object need to interact before a moment of reality can occur. Matter and energy are not in themselves phenomena, and do not become phenomena until they interact with the mind. on the mind, personal relationships, meditation and the spiritual path. '..Dualism implies that mental experience is a radically new feature that only humans possess, and a late optional extra slipped into an already well-defined, functional, physical universe As dualism in one form or another continues to be the predominant teaching of the church, it is apparent why there is so much antipathy from fundamentalists towards the theory of evolution. It is extremely difficult to envisage how a mechanistic zombie (animal) could have gradually evolved into a dualistic being (human)..'.